SSR entered the coal haulage market in 2010, and has proven its capabilities to deliver an unparalleled level of customer service and flexibility. Current operations centre on rail freight services from four mines located within a 250 km radius of Sydney, and transporting this resource to the four primary export terminals in New South Wales (Newcastle Coal Infrastructure Group Kooragang Terminal, Port Waratah Coal Services Kooragang Coal Terminal, Carrington Coal Terminal, and the Port Kembla Coal Terminal). In addition SSR also supplies coal to Eraring power station through the station’s state of the art quick drop wagon discharge system. SSR has the ability to haul any coal products from any location throughout Australia. SSR is also a proud member of the Hunter Valley Coal Chain Coordinator (HVCCC). SSR specialises in providing heavy haulage rail freight services that meet our individual customers needs. SSR has the ability and experience with heavy haulage of commodities to provide a range of services from full service delivery, including provision of equipment, crewing and management, to operating equipment owned by the commodities producer. 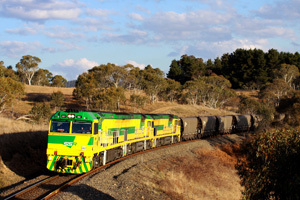 For coal haulage and rail freight in NSW, Victoria and all of Australia, the team at SSR can manage your requirements and deliver comprehensive rail freight services that reflect our commitment to customer satisfaction and high safety and performance standards. Contact us directly for more information on our heavy haulage commodities services.